The BPM Framework operates in parallel with a Council’s Integrated Planning and Reporting (IPR) Framework, to ensure that long-term community planning includes appropriate management of the urban water cycle. Local water utility planning activities can be key inputs to the IPR’s Resourcing Strategy, 4-year Delivery Program, Annual Operational Plan and Community Strategic Plan. An example of this is the water supply and sewerage levels of service developed in an IWCM will be a key input to IPR’s Community Strategic Plan. It is important to note that under IPR, each council is required to implement the BPM Framework outcomes for water supply and sewerage. 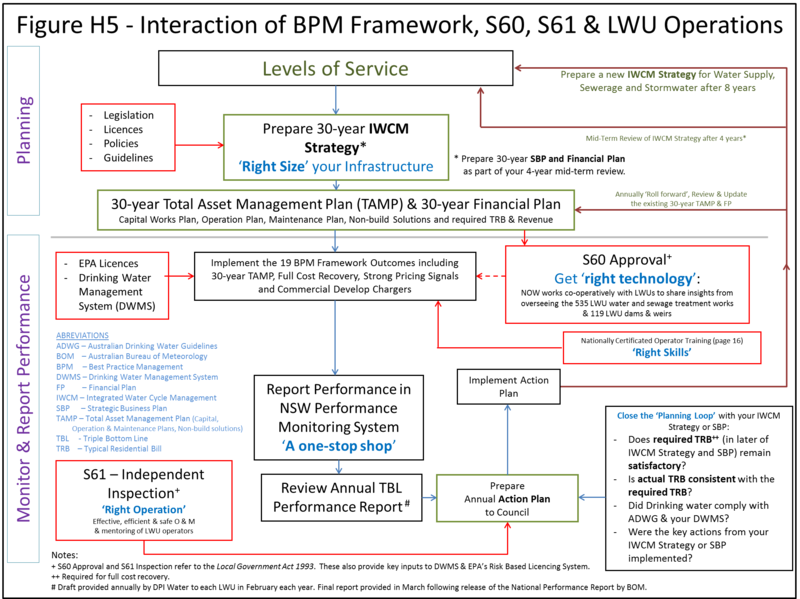 The figure below shows the interaction between the BPM Framework, S60, S61 and local water utility operations. Section 60 of the Local Government Act 1993 assures the use of ‘right infrastructure technology’ for the specialist areas of water and sewage treatment works, dams and water recycling projects. Section 61 inspections of the 535 local water utility water and sewage treatment works assure effective, efficient and safe operation and maintenance for this infrastructure. Nationally certificated training in water and wastewater treatment, fluoridation, dam safety inspection and liquid trade waste regulation enables local water utility operators to acquire the necessary knowledge and skills to effectively and efficiently operate and maintain this infrastructure. Download the Interaction of BPM Framework, S60, S61 & LWU ((PNG 255.9 KB)) diagram.